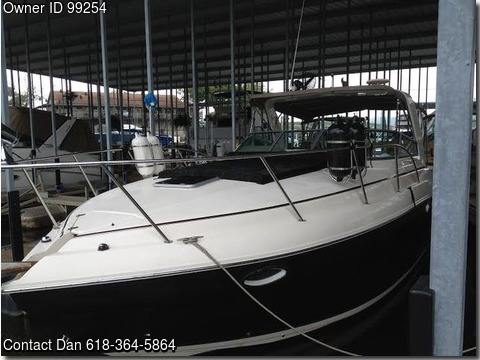 Please call boat owner Dan at 618-214-0297or 618-364-5894.Boat located : Eddy Creek Marina, Eddyville, Kentucky. Boat on Dock 5 at Eddy Creek Marina in Eddyville, KY.
She is in like new condition - new carpet, and all covers are included. New sunpad with cover on front. AC reverse to heat, Bose stereo w/remote, 5 CD charger satellite ready, Bimini top, camper top, Coast Guard pack, GPS, depthfinder, fishfinder, dockside power, VHF, 5kw generator, galley, 2 refrigerators, stove, head, new vac u flush system, shower, H&C water, 4 SS props, 4 batteries, windlass, sleeps 6, . Engines serviced every year, new bottom paint Spring 2014, new impellers on engines.